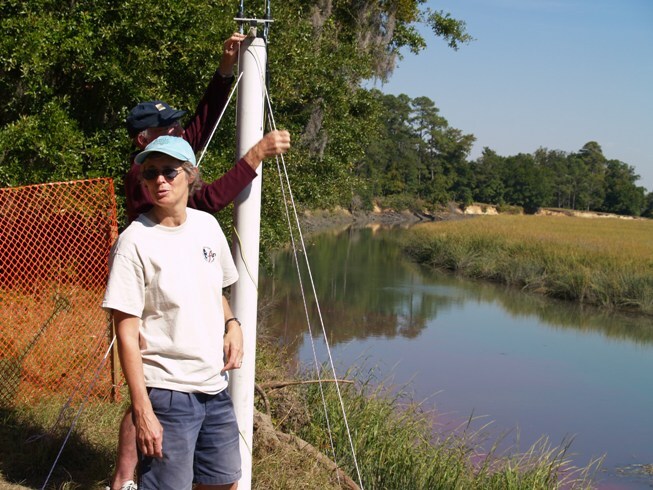 Skidaway Institute of Oceanography professor Dana Savidge aims much of her research efforts towards observing the way ocean currents move in the Gulf Stream and across Georgia’s continental shelf. Those efforts have paid off in the discovery of a series of previously unidentified eddies which may have a significant influence on the way energy and material are transported between the Gulf Stream and the shelf waters. Savidge’s findings were published in a recent issue of Geophysical Research Letters. Jonathan Norman from Armstrong Atlantic State University also contributed substantially to the analysis, along with several members of the Skidaway Institute team, including Trent Moore, Julie Amft and Catherine Edwards. 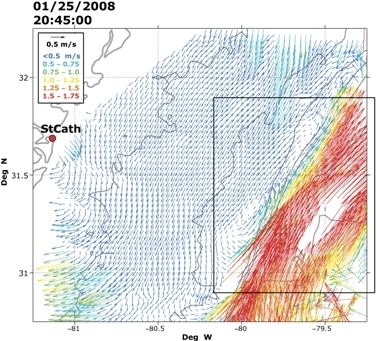 These researchers observed Shelf Edge Tide Correlated (SETC) eddies by using low-power, high-frequency radar systems that monitors surface ocean currents across the continental shelf and out into the Gulf Stream. The small, short-lived eddies spin up along the western edge of the Gulf Stream twice daily, as the tide turns. They move southwesterward, along the shelf edge — sometimes drifting towards shore — before dissipating two or three hours later. In this graphic depiction of radar-derived coastal currents, the color, length and direction of the arrows represent the velocity of surface currents. The Gulf Stream is clearly evident in red and yellow. A Shelf Edge Tide Correlated eddy can be seen in the box on the left edge of the Gulf Stream. In addition, fluctuations or meanders in the Gulf Stream’s flow pull nutrient-rich cold water from the deeper ocean and onto the shelf, providing a basic food source for marine life. The newly-discovered eddies apparently affect both those processes. Skidaway Institute scientist Dana Savidge standing next to a research radar antenna. The nutrients from the deep ocean that the SETC eddies lift across the shelf edge and into the sunlit upper regions of the coastal ocean may contribute to phytoplankton growth, thereby potentially contributing resources for the shelf’s wider range of marine life. “Similar eddies may occur along other continents where currents like the Gulf Stream exist, so it will be important to determine how important they actually are in the complex interaction between the Gulf Stream and the coastal waters.” Savidge said. The research was funded with grants from the National Science Foundation and the National Oceanic and Atmospheric Administration (NOAA). The radars were purchased with funding from the Georgia Research Alliance and NOAA. “It’s a really exciting place to do oceanography, because you can throw almost any kind of instrument over the side, and it will come up with observations that lead to new science,” said Skidaway Institute scientist Catherine Edwards. A former postdoctoral fellow at Florida State University, Edwards describes her recent research cruise to the little-studied “Big Bend” section of the northeastern Gulf of Mexico. One of Skidaway Institute’s instrument packages is lowered into the water. In an effort to extend FSU’s coastal ocean observatory in the Florida Big Bend, Edwards deployed two self-contained bottom-mounted sensors that measure temperature, salinity, currents, and how they vary from the seafloor to the surface. The sensor packages are moored on the outer shelf to help Edwards and FSU scientists learn more about how the Gulf wind and tidal currents transport material from the shelf edge to the shore. 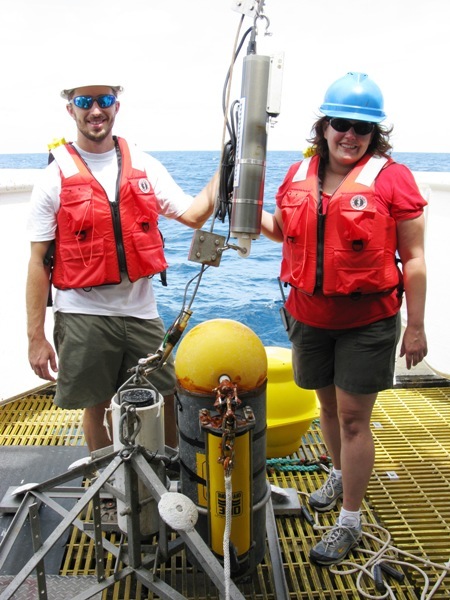 Edwards was assisted by Austin Todd, a graduate student in physical oceanography at Florida State University. Catherine Edwards with FSU graduate student Austin Todd and one of the instrument packages. Many fish are spawned at the shelf break, but spend their juvenile stages in the salt marshes and estuaries. Distances of 50 to 75 miles are too far for fish larvae to swim on their own and physical models, by themselves, do not fully explain how larvae are able make the journey. Edwards does have an idea. Coastal sea breezes shift on- and off-shore between day and night during spawning season in the Gulf of Mexico. The winds push the surface water in one direction, while deeper waters compensate with currents in the opposite direction. The cruise wasn’t easy to arrange. Edwards had access to the needed instruments, but no money for ship-time, which often runs thousands to tens of thousands of dollars a day for capable oceanographic vessels. She was able to hitch a ride on a NOAA National Marine Fisheries Service (NMFS) vessel that was conducting a twice-annual cruise to studying fish biology throughout the Gulf of Mexico. 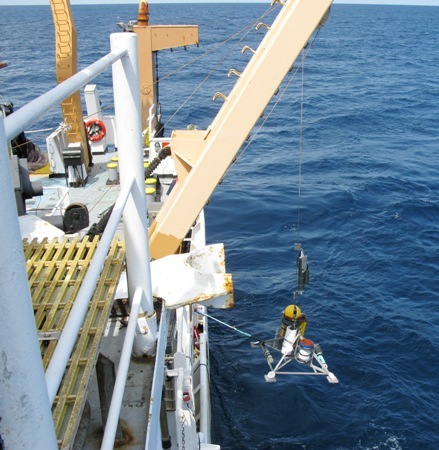 Edwards set up two sets of instruments very near a NOAA weather buoy. While the weather buoy collects data on the conditions above the surface, Edwards’ instruments will do the same for the conditions in the water column. Since weather conditions often drive water movement, the ability to combine the two data sets will provide valuable information. Edwards will return in six months to collect her instrument packages and the data they have recorded.